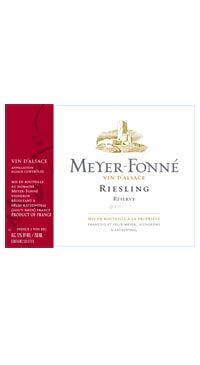 Felix Meyer’s grandfather founded the domaine in the late 19th century. He took over the domaine in 2005 and has modernized the winery and continued to expand the family’s vineyard holdings to include some grand cru vineyards in Alsace, all while staying in touch with tradition and respecting the terroir. Felix is a master blender and skilled winemaker; he blends wine from different parcels and ages his wines on the fine lees in old foudres, as was the tradition in Alsace. The Riesling Reserve has a pure, elegant nose, with mineral notes of aniseed and citrus. As a dry, mineral wine it is ideal for serving with fish, seafood and shellfish. It’s all about the details at Meyer-Fonné, with an emphasis on tradition and respect for terroir. This wine is everything I want in an Alsatian Riesling: aromatic, textured, racy and elegant. Shuck some oysters or treat yourself to some canapes this holiday season.